Gravity has never been more useful! The new Spiral Chutes from Dorner are an economical way to gently move product down to a lower level…with gravity doing all the work. As product enters the Spiral Chute, gravity takes over to safely slide packages down to the lower level. 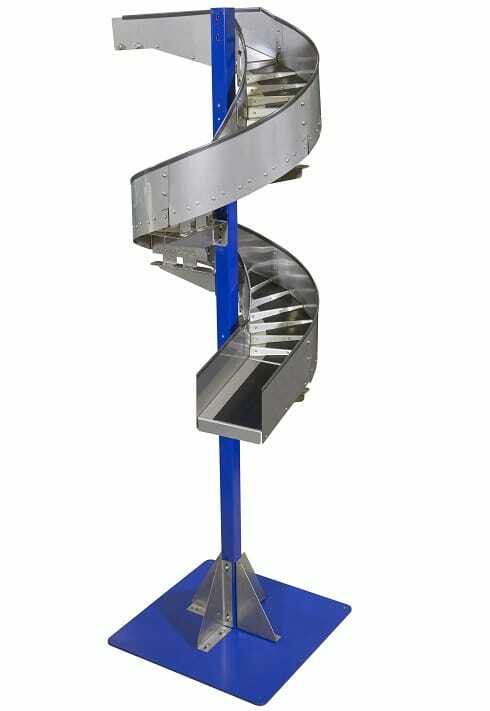 Spiral Chutes’ patent-pending stair step design ensures products won’t get stuck or jammed when being lowered from overhead conveyors, mezzanines or platforms. Even if packages begin to accumulate as they travel down, the Spiral Chutes’ design is self-clearing to prevent jams. Spiral Chutes are ideal for lightweight products with a variety of package types, including cardboard, pouches, flexible packaging, corrugated boxes and others. The stair step design allows for different sized packages (lengths as short as 3”; weights between one ounce to 50 lbs.) to be lowered at the same time for added flexibility. I am interested in purchasing one of your 24″ wide chutes. to provide a means to get product down from the second level in case of sortation failures. Can you please let me know the location of your company so I can get this request to the correct person? Or you can email us at info@dorner.com. Is 24″ the absolute max width at this time? 24″ is our widest standard size, but we do have the ability to go wider. Please contact us at info@dorner.com or (262) 367-7600 if you would like to discuss your application.